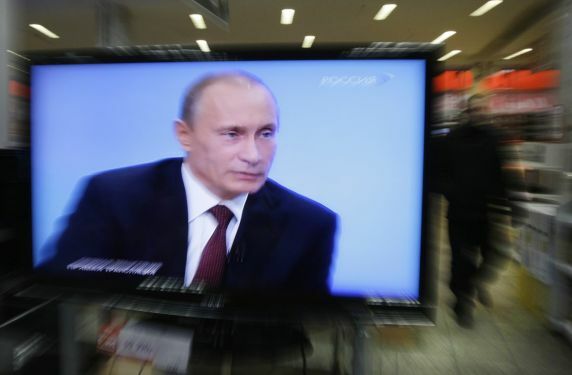 Pencils Down, Pass the Remote: Putin's hold on the media slips, but for how long? Putin's hold on the media slips, but for how long? Photo courtesy of the Moscow Times. The New York Times ran a fascinating piece today about how TV news shows in Russia - which are almost entirely state-controlled - are being forced to acknowledge the changing political situation. A concentrated dose of Russian television — still where 70 percent of Russians get their news — shows that the ferment is too big to ignore: The Kremlin-loyal networks that at first airbrushed out the protest movement are including it in their newscasts. Now, brisk updates on voter fraud, anti-Putin rallies and opposition candidates share a news hour with long, choreographed tableaus that showcase Mr. Putin as prime minister, hard at work inspecting factories, raising pensions, scolding lazy bureaucrats, and doing what it takes to preserve stability and spread prosperity. He has taken to publishing long mission statements for Russia’s future; each one is framed on the news like a tablet from Moses. For viewers the effect is bipolar: a little bit NPR, a little bit North Korea. The Times piece illustrates a fascinating dynamic at play in recent resistance to Putin. Because of the rise of digital connection - the article notes that "Bloggers and political Web sites not only contradict government-tailored newscasts, they also offer an alternate, unscripted reality - live, via cellphone camera and Skype" - the Putin administration can no longer rely on TV news to promote their agenda while ignoring all others. In the same way that the recent election fraud was immediately brought to the attention of the world, anti-Putin sentiment can't be glossed over by the news programs unless they want to lose all credibility with the Russian people. Many Russian journalists and media stars have leapt at the chance offered by the government’s tactical shift. Yet few reporters predict that the freedom will survive beyond the elections, since nobody expects Mr. Putin to lose. Vladimir Putin is many things, but stupid is definitely not one of them. He'll probably adapt to the new media environment and keep himself in power. That's going to be harder, however, now that he knows someone is watching.